Thanks Pauly for your reply at "Flow Through System: How optimum tall of each worm bin? (part1)", now I attach my worm bin pictures. 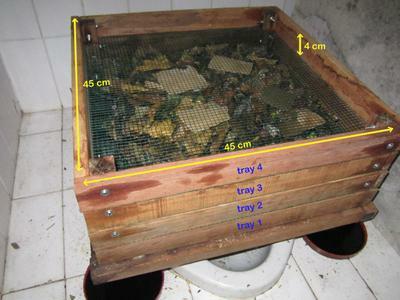 As my attached pictures, there are two kinds of trays, 9 cm height tray and 4 cm height tray. By the way, refer to my story about 9 cm height tray problem (the castings are too heavy and compact) which I told you at my last posting, that's my own mistake. I just aware it. My worm foods contain too much liquid, lack of carbon, and less of dry material. My castings have bad smell also. I plan to develop my worm farming. That's why I think that I have to make my worm bins much more. So, I want to ask you a question. 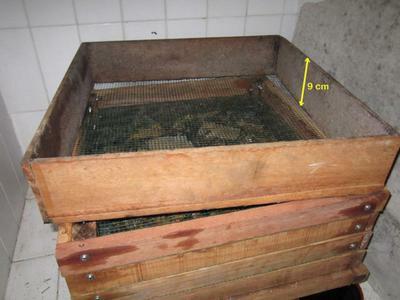 Which one is better, the tray with the high height (9 cm) or short height (4 cm)? Is that okay to make the tray with 9 cm height? I have ever read an article that worms don't like to stay so much in their abundance castings. In addition, if the better choice is making 4 cm height tray, that's mean I need extra working and extra funds. Sorry it has taken so long to get back with you but I would use the 9 cm (3.5 inch)high trays. This is the the width of a regular 2x4. You want to have plenty of castings in each tray and if it's too heavy then go smaller on your Length x Width. This would be more practical for any worm farmer. Look at the Worm Factory that I sell on my site. It's not too long and wide but practical enough to move around and lift the trays. Thanks for your pictures...they are awesome and keep up the great work. Okay, thanks Pauly, I will prepare to build 3.5inch height wormbin. Thanks for your support about this awesome project for our beloved mother earth healthy.